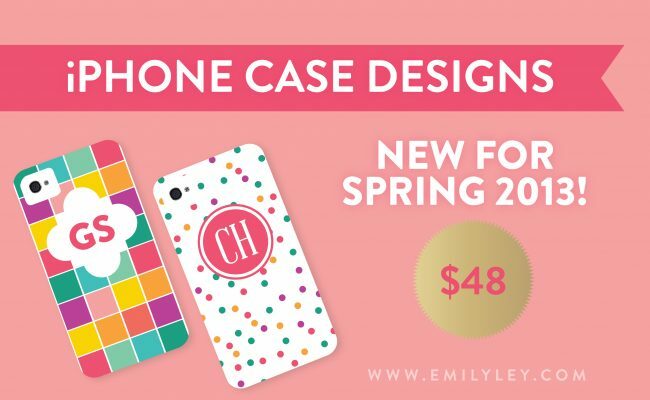 I don’t know about you, but I’ve been swooning over the iPhone case designs Emily launched a few weeks ago! So much so that I immediately ordered the Emerald Stripe one for my own phone. ( I’m slightly stripe obsessed! ;)) Since then, as orders have come in and the iPhone cases have arrived in the shop, I literally “Oooh” and “Awww” over each one. Confetti. Color blocking. And, my absolute new favorite, Emerald Debutante Stripe. Oh. My. Goodness! We loved each and every one of these new designs. And, we think you did too. But, well, as much as these cases were beautiful, we kept thinking over here, they were just missing something. They were missing what so many of you love about Emily Ley (besides her enormous heart and infectious spirit)—a little personalization! So, we are excited to announce that these iPhone designs now feature a place to add your monogram! YAY!